Do not drive your vehicle with too little or too much pressure in your tires. 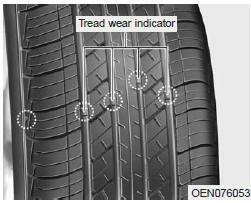 This can lead to uneven wear and tire failure. • When replacing tires, never mix radial and bias-ply tires on the same vehicle.You must replace all tires (including the spare) if moving from radial to bias-ply tires. A compact spare tire has a shorter tread life than a regular size tire.